These are two pictures, above and below here, of the same Viking Pool Fence installation, from each end of the pool. 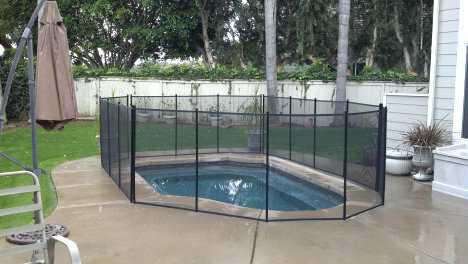 This was the second San Diego pool we fenced for this customer. 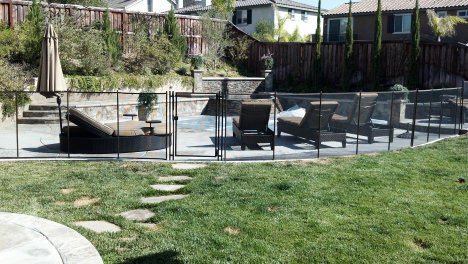 Pictured above is a 5' tall Viking Pool Fence in the Temecula Valley area with partitioned entrances to separate three different areas of the back yard. It was difficult to do, but turned out perfect. 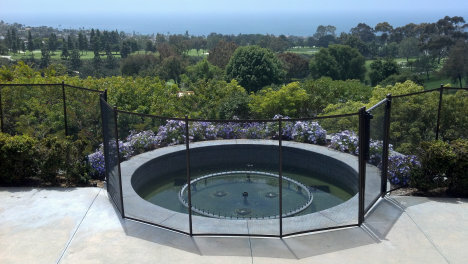 A beautiful view overlooking the Pacific Ocean and La Jolla Country Club, with minimal impact due to our transparent Viking Premium Mesh. The 'isolation barrier' above here goes all the way around the pool. This layout makes no contact with solid structures and is generally considered to be the safest way to enclose a swimming pool. 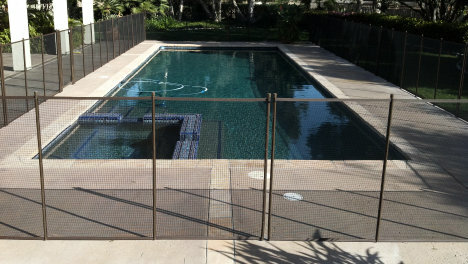 The Orange County installation shown above makes practical use of property fences and walls to make this pool as safe as possible. 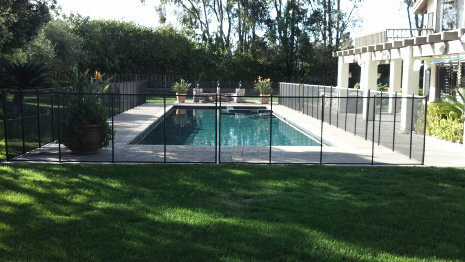 We also installed pool fencing at this customer's parent's home and brother's home. 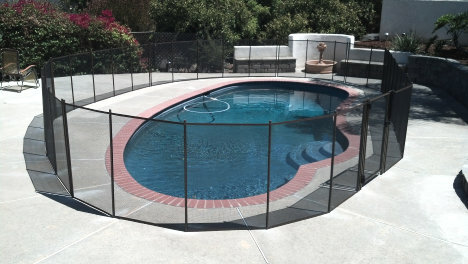 The Viking Pool Fence pictured above has a nice arc to it, which contributes to the pool fence being less noticeable from the house, and makes good use of the area inside the pool fence. 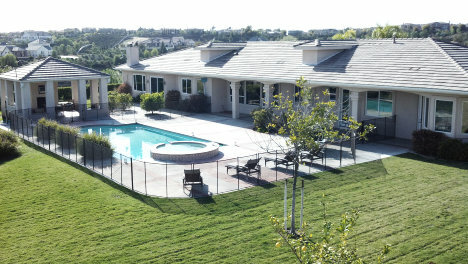 Above here, a Viking Pool Fence in Riverside County leaves lots of room for lounge chairs inside the protected pool area. This 'isolation barrier' pictured above was the first home improvement made here, and was done at about the same time this family was moving in. They made sure their children were safe from the start. 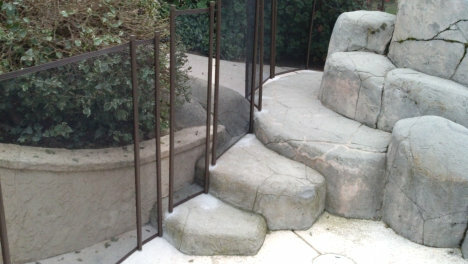 Above is some custom step work we did at Sergei Kaminskiy's home with his Viking Pool Fence. Sergei owns Kaminskiy Design and Remodeling, a 'U~T San Diego's Best' home remodeling company winner. Above here is a vacation rental home, so the pool fence has to be safe, attractive, and durable. Viking Pool Fence accomplished exactly what this customer needed. Nothing protects better than Viking Pool Fence. 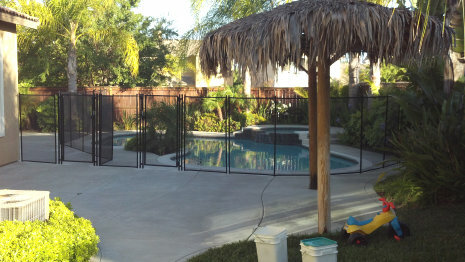 Because this removable Viking Pool Fence pictured above will only be used part time for grandchildren, this customer chose not to have a gate, and uses an opening in the pool fence sections to enter. Another very safe Viking Pool Fence 'isolation barrier', with some extra room built in to sit next to the pool. 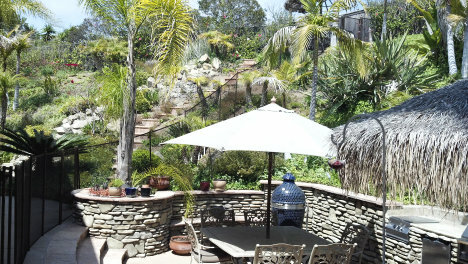 This home had a couple of very challenging slopes, which some pool fence companies won't do. 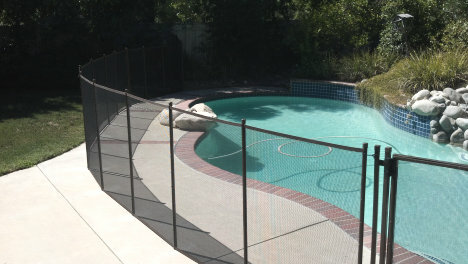 This customer was very happy with the results Viking Pool Fence was able to accomplish. 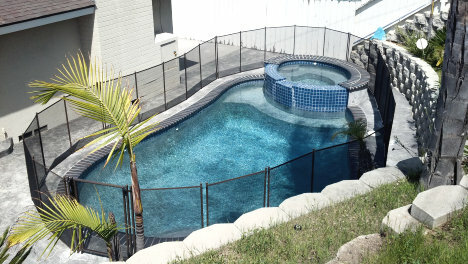 Compare our features, advantages, and benefits to see for yourself why Viking Pool Fence has all the best components in the pool fence industry, which will help you keep your children safe. 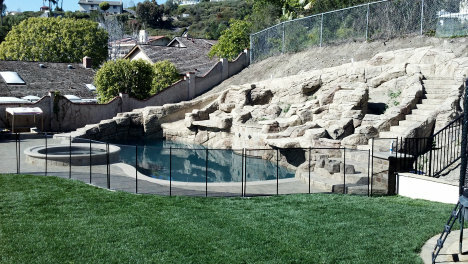 Our fence is manufactured with the most transparent, safest mesh available, so you can easily see through it for safety, and just to enjoy your view. Our poles are the strongest made, yet they have the smallest drill holes in the industry. Our transparent Large Hole Specialty Mesh and Unbreak-a-Pole Hybrid Aluminum Poles with 1/2" stainless steel rod bottoms are premium features.